From time-to-time I like to stretch my fiber-arts legs and try out something other than knitting (heresy, I know!). Sometimes, I roll out the ol’ spinning wheel and, well, take it for a spin. 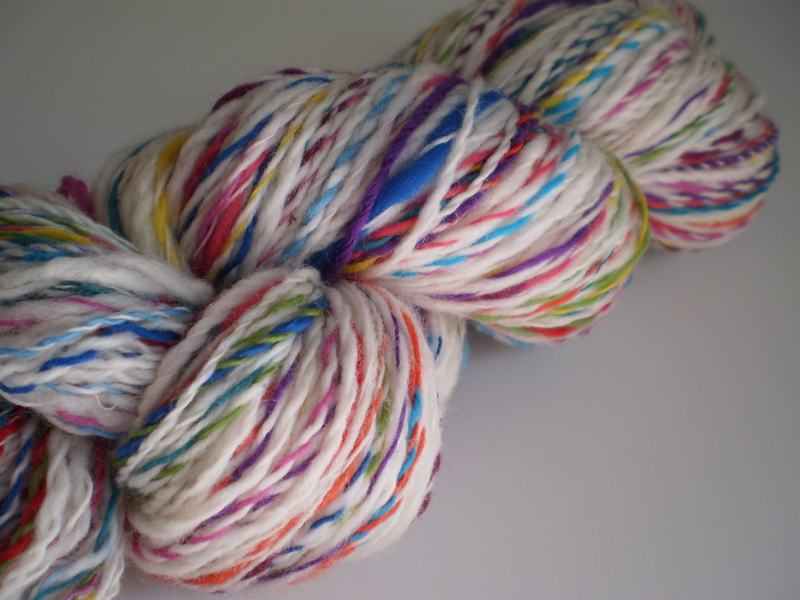 This time, I impulse-purchased a big bag of bright white roving, and little tufts in a dozen bright rainbow colors. I couldn’t tell you what kind of fiber I bought, because, well, it’s taken me more than four months to finish this skein, and any notes or labels I might have had when I purchased the wool are long gone. I spun the roving into singles with alternating long white stripes and short-ish (about 3 feet long) sections of random color. Then, last week, I finally plied the yarn into more than 250 yards of squishy 2-ply loveliness. OK, it’s not perfect… I did my best to keep the yarn an even aran-ish weight, but with the weeks-long breaks between bouts of spinning, and my less-than-stellar spinning skills, the yarn ended up with a bit of a thick-and-thin consistency. And my first attempt at 2-ply yarn left it with less-than-perfect evenness. Oh well! It gives the yarn character, right? Right? Have you ever tried spinning? How did it turn out? This entry was posted in On My Needles and tagged colorful, funfetti, not knitting, rainbow, roving, spinning, white, wool, yarn on October 5, 2015 by onemilljellybeans. Oh yes, this is lovely! I just learned to spin about 6 months ago and really enjoy interspersing it with my knitting projects. It helps to keep everything fresh. 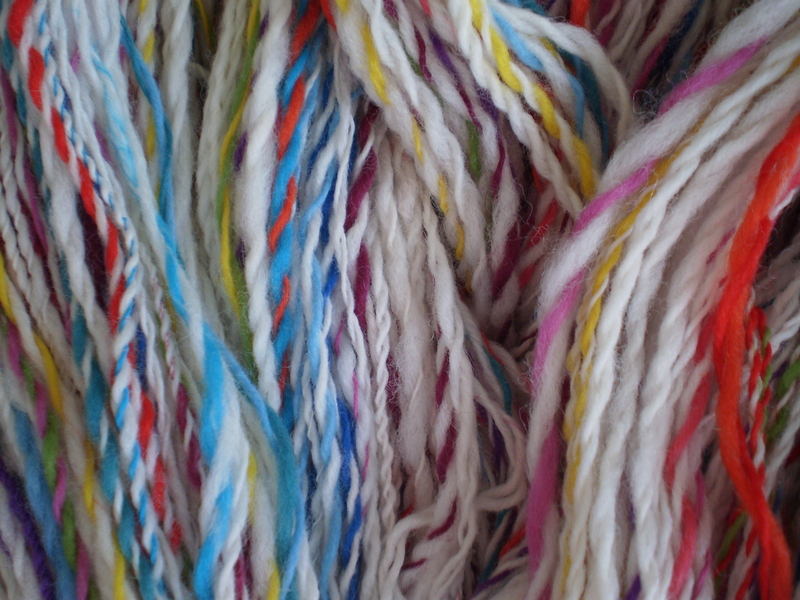 Plus, you can learn so much about yarn, fiber, and construction through spinning. I have some mill ends I need to spin up, and I love this idea of mashing up some white with the bits and bobs. Awesome! Thanks! That is so fun and cozy looking! Great job! I think you did a wonderful job and I can’t wait to see how it knits up!